Color(s) Shown: SPECIAL! SAVE $75 ON THIS GORGEOUS SILVER SET! This sensational "silver"susti is not a dye but the product of a tight weave of black and white threads that create the perfect heathery gray! And this luxurious silver susti is the star of this deliriously soft set... IN STOCK NOW! It's twilled and woven on traditional looms in Morocco, the YUMMIEST cotton/rayon susti (susdi), which I call the cashmere of cottons... if you don't know susti yet, you'll wonder how you lived without it! To see more details—and measurements!—about the scrumptious Dairi Sharqi kimono, click here; for the flirty Rif top, click here ... and for more about these fun and comfy Tienda Ho Sonya pants, look here. The color elevates this set to the high end of casual, and the Sharqi jacket carries it over the edge into evening/occasion just by slipping it on! 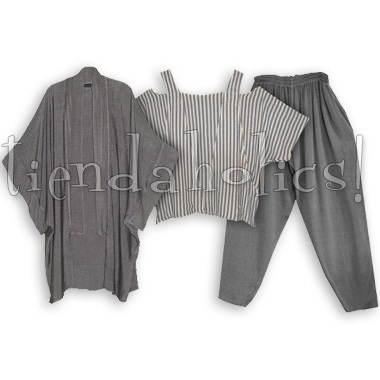 (In these special fabrics, these pieces sell separately for $295!